Is this the cure for Table-itis or even Table-phobia? Educational Insights decided to throw out the table and make slammable bubbles instead. Works for us! For sure! 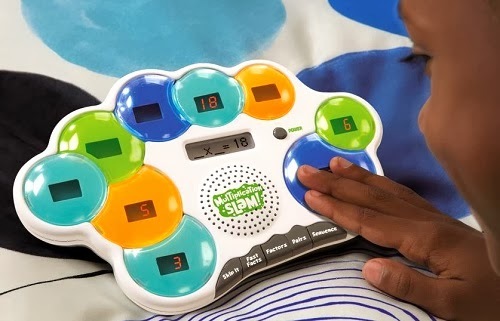 AGES: they say 8+ but if your child is starting to skip count then you might want to consider this sooner than that. GIVEAWAY: Yahoo! 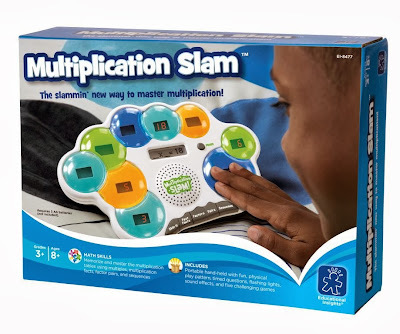 One Winner will get ONE Multiplication Slam! Canada and U.S. addresses only. By beginning of first grade, #1 had established himself as a "math genius." Truth be told, I kind of thought he was too. However, as the year progressed, slowly the "genius" image began to fade. I saw it especially when he was learning multiplication. I was surprised that he wasn't spewing off the tables quickly. So I tried various methods of having him write or recite them to see what the trouble was because I could definitely see that trouble was coming. Did you ever do this? I remember getting a yellow paper that was the texture of newsprint, folding it into halves or thirds and then writing the times tables in each column of the folded paper. Well, we tried that. He didn't like that... moving on.. This is something that I've seen in Asia. 2,2,4; 2,3,6; 2,5,10; etc... They don't even bother saying "times" or "equals." Anyway, we tried that... not so great.. moving on..
What was happening? Minutes before the ball game, he was fumbling for the answers and now... now, he's spouting out the answers with a smile! And you'd think that this method of putting him on the spot and catching a ball therefore adding more tasks and possibly even a rhythm to it would give him more anxiety but the exact opposite happened. He relaxed and the answers just came. Despite my kid's sometimes klutzy ways, now that he's in the fourth grade, I have come to learn that he is a kinesthetic learner. 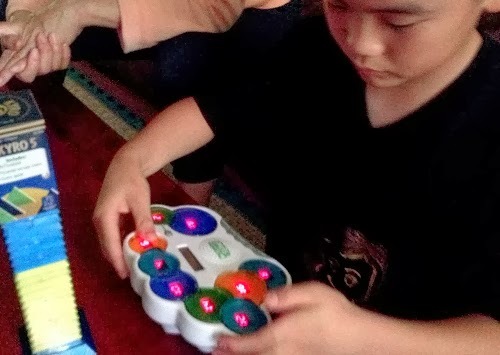 He likes using his limbs, his feet, his fingertips, basically some part of his body has to make some movement and then he can be a better learner. 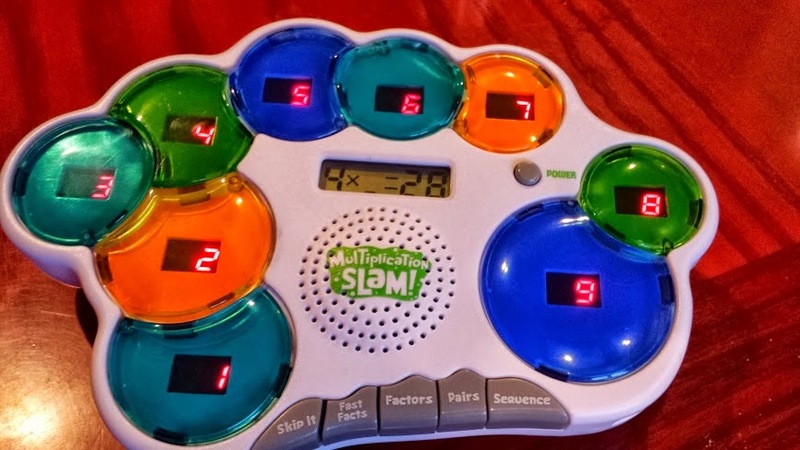 This is why I LOVE LOVE LOVE LOVE LOVE Multiplication Slam. They are serious about the "slam." You really can slam it. (though I wouldn't invite them to hurt themselves). When I saw this at the Toy Fair, I knew I had to have it. This way I could take the ball and me out of the equation and make this more a self-learning, self-testing process. Because I really want my son to be his own "executive" that is why I am totally focusing my efforts on my kids being independent for homework and studying for tests and other fun things like shampooing one's hair so that it will actually be clean when removing oneself from the shower. More on that some other day... For now I am going to focus on why Multiplication Slam works for us. This is the pairs game. This is the first sequence problem in Level 3. Pushing or Slamming is easier than writing. Writing for some is in itself work and while I'm all for learning by "doing" which can include writing sometimes, there is a point where the work part gets too hard and so there is less learning. I think we have to help our kids search for their flow so trying out this method now, your child could be discovering that this is the way he will memorize the Periodic Table of Elements or "i before e except after c."
Additionally, slamming is liberating. Take it from someone who broke a cup (kind-of on purpose) last week. I don't even remember why I was so mad but I was and I know I was being a bad model but damn it I had to slam something. I think memorizing anything causes tension and I think a little tension is good- it keeps us alert. This is why I like this game, there is tension. They're not afraid of it. Actually, I believe they are using it to help your child. Do You Have a Math Dance? This may sound like I said peanut butter and steel but I've been learning that dance and math go together very well. If you think about some concepts within math like pattern recognition and spatial reasoning, then I think you can see how dance has a lot to do with math. Isn't doing the box step, an exercise in pattern recognition and spatial reasoning? You know the music but by 0:39, you will be really surprised and maybe mad if high school math caused you a lot of stress. While the answers in Multiplication Slam need only be slammed out. (No Macarena needed), the music does affect you. There is no way it can not. To us, it makes us smile and wake up. Even Grandma got in on the action. 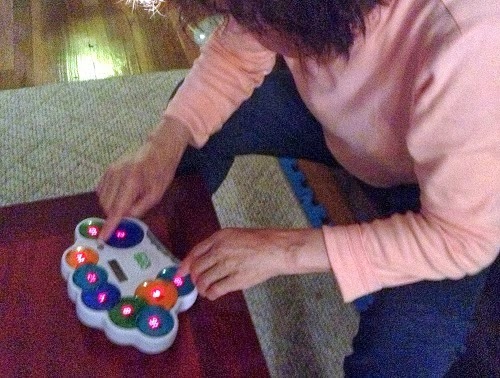 I never thought about how this could be a game for grandchild and grandparent but it really can. Go ahead, make it competitive. 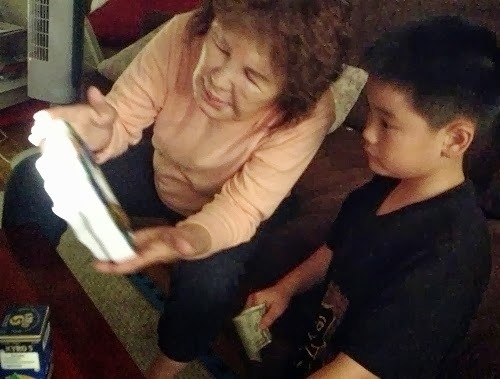 In our family, where language can be a problem, (Grandma's first language is Korean), games like Math Slam are just so social. Music and Math are universal. At first famous performance artists (and they do other things too), Erik Stern and Karl Schaffer can be seen in this video giving a TED talk about their work in dance and math. At 3:10 they start to discuss how their work has led them to discover about people learn. First, embodying the problem, it's memorable its social it's creating, it makes the mathematical ideas accessible. Second, physical energy in the classroom far from being a distraction can be an opportunity for all ages and all disciplines. Third, choreographic and mathematical thinking are composed similar building blocks noting changes and remembering sequences, asking if things are bigger or smaller, checking your work to see if it's consistent and so on. This is a great add-on. You can rest easy knowing that you don't have to listen to know all that math which from which your deserve to be free. There are headphone jacks for somewhat silent slamming. There is a machine asking you questions. A BUZZ-sound comes out when you mess up. You get scores. You can adjust the volume so the grown up can walk away. The best part about it is that it's NOT an iPad! Btw, one could confidently argue that if you're slamming, you're learning but you can't slam an iPad. 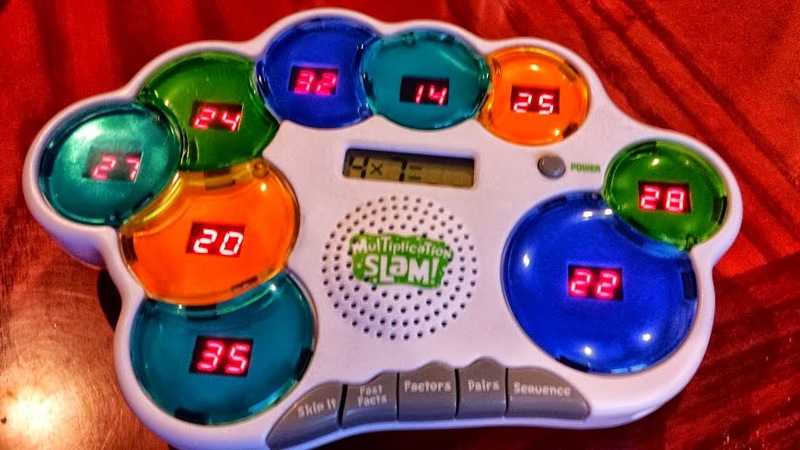 Believe me, I do not think this replaces instruction in anyway but one thing I know about multiplication is that we can teach the concept over and over again but they are required to memorize the times tables and that is a completely different animal to me. Grandma (in the pink) looked pretty interested in this game. Memorizing something can take a lot of time and you want some of that or even all of that to be done independently but one day... argh.. dare I say it, when it's 3 am and they are memorizing, names and dates, pictures, for their art history final exam, they will hopefully have learned how they learn and memorize best. 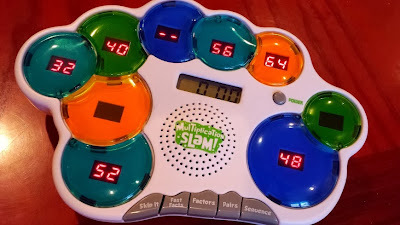 I am so glad we got Multiplication Slam. Not only has it helped with the dreaded times tables but it's also helped us learn a little more about how we learn. My son dances out other things now like spelling words and who knows what else. 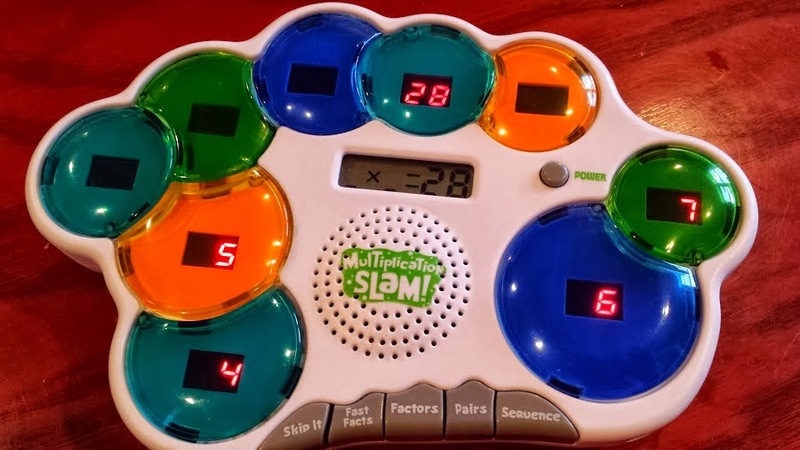 I can't credit Multiplication Slam for it all but there is no doubt in my mind that it has contributed to these wonderful results. Soon she grabbed it and gave it a go. HARK! Do I see a dollar bill? Was there a competition? I must have words with them. Okay people, it's time to show the world how much we love Multiplication Slam. I really want more single-function games like this to be made. It's such a relief to me to be able to use electronics without locks and access codes... Enter to win your own today! Canada and U.S. only please. Just fill out the Rafflecopter form below. Questions are about Educational Insights new products, about how you learned the times tables and about executive functioning and school fundraisers. I want to know your thoughts! About Executive Functioning: This is something you want to know. Do download a FREE and well-constructed and thankfully thin e-book at NCLD.org It's LD Month folks! There is a cute infographic that is free as well. * See the Cookie Monster video in this post to learn a bit about how Sesame Street is focusing on teaching Executive Functioning this year. It's exciting. I learned the times table the old fashion way memorization and parroting them back. 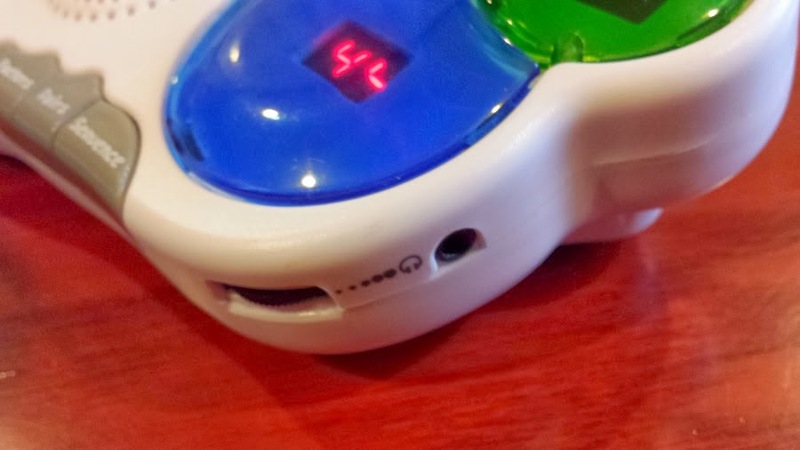 It was like pulling teeth; no fun. Memorization is like learning in a vacuum; no concrete use for it, easily forgotten without the drilling. What is the exec function? In a nutshell, I believe that it is involved when we are learning new things, confronted with new situations and have to make decisions. In those terms, it can is taught anytime, on any subject, at home or at school. I don't think state tests are worth much except disrupting teaching and learning; however, based on my understanding of exec function, it might be the only thing that should be tested as opposed to plain regurgitation of facts. Yes, we do fundraisers. We have an auction/dinner every year, which is when we raise the most money. We involve the community and make it available online; some items are tangible and others are not; all are donated. Other smaller fundraisers involve, holiday flowers, bbq evening, bake sales, and book fair. I learned my times tables by writing them over and over and oral quizzing. They stuck, but I wish they would have focused more on skip counting. Wordical looks fun. My boys would probably like it. I don't know what executive function is, but it seems like it's using your brain to think and figure things out instead of just repeating information. I think both ways of learning have value and should be taught in school and at home. We homeschool, so no fundraisers. Except at Christmas and birthdays, I always try to get family to buy fun and educational games that will stimulate my children's minds. The only fundraisers we have had so far was for his horseback riding therapy & the school did pampered chef. I love the hot dots series......Hot Dots® Laugh It Up! Spelling Cards, Grades 1–3. We homeschool so I have no comment on iExecutive function being on the state tests.